The last weekend in February saw Bremex return to Inchree, an excellent location about half way between Fort William and Glencoe. On our previous visit, exactly 12 months before, our accommodation had been in the bunkhouse with its motel-style layout, but on this occasion we were in two chalets – one for the men and one for the women. The meet started on the Friday evening, but some people went up earlier. 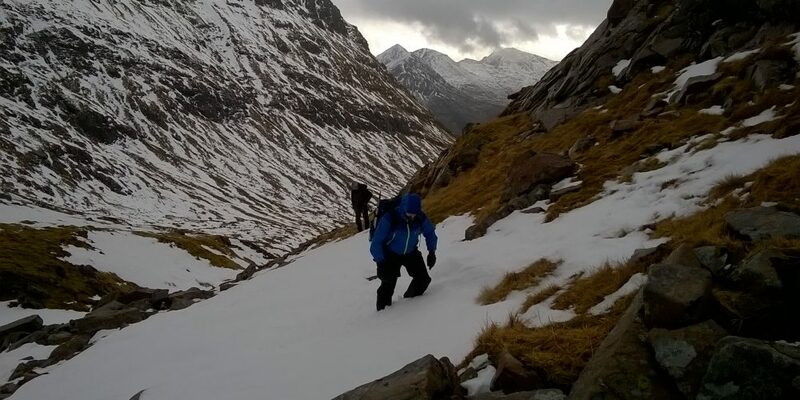 Two of the more intrepid members went ice-climbing on Ben Nevis. 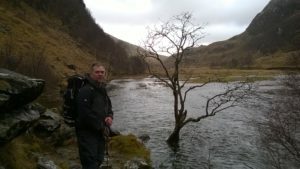 Another, having travelled from London on the sleeper train on Thursday night, got out at Corrour, in the middle of Rannoch Moor, and trekked 15 miles to Kinlochleven before catching the bus to Inchree. 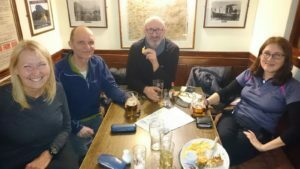 That evening we all met in the bar, which is the hub of the Inchree around which the holiday accommodation is arranged. 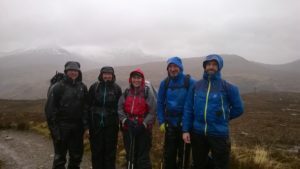 The forecast for the next day was for heavy rain and strong winds, so we ruled out any summits and instead planned a linear walk, crossing a high bealach (pass) to the east of Ben Nevis. Next morning, unusually for Bremex, a schism arose between the men, who were ready to go at 9.00am, and the women, who were still enjoying a leisurely breakfast and in no rush to expose themselves to the wind and rain. It was therefore agreed to form two separate groups that day. We men took two cars, leaving one at the Nevis Range and driving the other to the top of the Glen Nevis road to start the walk. By this time the rain had stopped and the day turned out much better than expected. Other walkers had obviously been put off by the forecast, however, and Glen Nevis was remarkably quiet. The River Nevis and its tributaries were in spectacular spate with the waterfall coming down from the Allt Coire a’ Mhàil forming a mighty cataract. As we ascended the right bank of Allt Coire Giubsachan, heading north from Glen Nevis towards the pass, we practised our navigation skills by checking from time to time that we were aware of our exact location. We did this by reading the contours, considering our timing and, with some caution due to the varying atmospheric pressure, using altimeters. 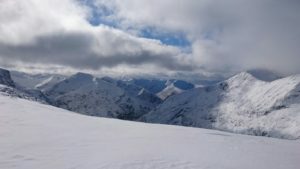 Above about 500m we were ploughing through soft snow, which made the going rougher and the ascent more strenuous, but as we ascended and looked behind us, we were rewarded with a spectacular view of the eastern Mamores on the south side of Glen Nevis. At the top of the snow-covered pass we were within one kilometre of Aonach Beag (1234m) Aonach Mòr (1221) Carn Mor Dearg (1220m) – the seventh, eighth and ninth highest peaks in Britain – and felt that we were up there among the gods. Our descent on the left bank of the Allt Daim was steep at first, but eased by the cushioning effect of the soft snow. Later the going got rougher as we had to traverse slopes covered in deep heather with no sign of any path. 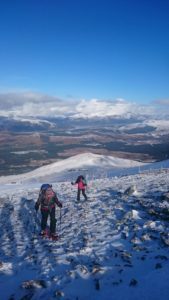 We could have contoured round to the north side of Aonach Mòr to take the gondola down to the car park at Nevis Range, but we opted instead to continue our descent and follow the track through the forest. This required us, however, to cross over the Allt Daim at a lower point where it was much wider. 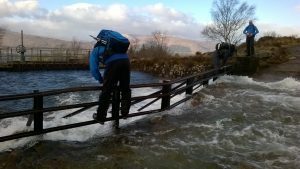 There was a ford, but no bridge, and the only way to get over was to shuffle across a metal railing just above the raging torrent, which would have quickly swept away anyone who had fallen in. The women had a slightly less exciting, but nonetheless fulfilling, day centred on Inchree’s local hill, Beinn na Gucaig (616m), where they practised navigation in pathless terrain, before returning on the woodland track through Gleann Righ, passing the waterfalls just to the east of Inchree. On the Sunday morning we were again greeted by wind and heavy rain, which continued for most of the day. 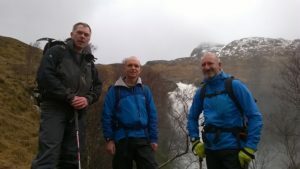 There was some talk of going indoor climbing at the Ice Factor, but in the interests of group cohesion we decided to walk a section of the West Highland Way from Kinlochleven to the road at the eastern end of Glencoe, using the car-at-each-end method as the men had done on the previous day. Although it was very wet, the wind had relented somewhat, so that we had a reasonably pleasant walk first through woods and then on moorland. For those of us doing this route for the first time, however, the finale was somewhat disappointing with the famous ‘Devil’s Staircase’ not really living up to its name. Two of the group then headed off south so that one of them could get a 6pm flight from Glasgow, while the rest of us returned to Kinlochleven to indulge ourselves with tea/coffee and cake in the café at the Ice Factor. Monday dawned bright and sunny with little wind, but it was much colder with snow and frost right down to sea level. 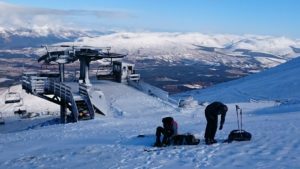 The remaining four people planned to climb Aonach Mor (1230m), so they drove to the Nevis Range and took the gondola and then a chairlift to start their walk at 870m. 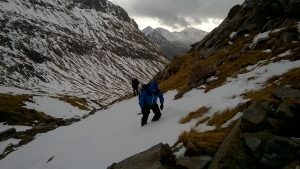 Conditions were benign, with plenty of fresh snow cover, but a low avalanche risk due to the cold. Ice axe and crampons were not needed, but two of the group used snow shoes. 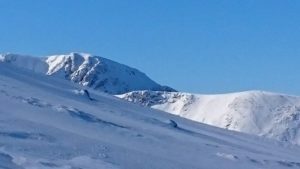 As they reached began the traverse of the broad summit plateau conditions continued to improve with bright sunshine developing and the cloud clearing from all the peaks except Ben Nevis itself. Having started walking at 11:00 they gained the summit cairn at around 12:30 where they stopped for a brief snack and hot drink. There they encountered a skier, one of only two other mountaineers they met that day. The group of four then continued to the narrow col with Aonach Beag, which had a prominent cornice. As most had journeys south ahead of them, they did not continue to the summit of Aonach Beag, but paused for a while to take in the stunning 3600 degree vista of the surrounding mountains shrouded in white, before retracing their steps and walking down to the car park. It had been a fantastic finale to the weekend.